In the summer of 1968, Sheldon Kotzin made what he calls “a life-altering decision.” After getting his masters in library science from Indiana University, he accepted a job offer to become a library associate at the National Library of Medicine. It was, he says, “the beginning of a long and happy relationship with NLM.” The relationship took him from associate to Associate Director for Library Operations (LO) and lasted a remarkable 43 years until his retirement in June 2012. “There hasn’t been a day in the 43 years I’ve worked here that I haven’t looked forward to coming to NLM,” says Kotzin, who describes the Library as his home away from his home. Kotzin’s career and contributions chronicle the Library’s growth; its early embrace of computers; its reach and its relevance. He headed the Catalog Maintenance Unit and the Collection Access Section. He was coordinator of the National Network of Libraries of Medicine; chief of the Bibliographic Services Division; and assumed leadership of LO in 2006. He was executive editor of MEDLINE; scientific administrator of the Literature Selection Technical Review Committee; and the Library’s representative to the International Committee of Medical Journal Editors. Speaker after speaker praised Kotzin for his knowledge and his leadership—his mind and his manner. NLM Deputy Director Betsy L. Humphreys, who has worked with Kotzin for almost 40 years, noted that he’s quick to point to the great work others are doing. “He is always deflecting the credit to the people who work for him and to his colleagues in other parts of the Library,” she said. 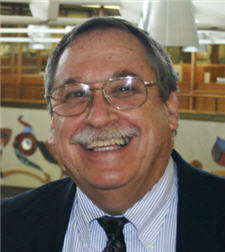 People throughout the NLM family recognized Kotzin in word and deed. Joyce Backus, Deputy Associate Director for LO, said that when word of Kotzin’s impending retirement got out, she was flooded with offers from people who wanted to help pay tribute to his years of service. Kotzin asked that any monetary contributions made on the occasion of his retirement go to the Children’s Inn at NIH, a home-away-from-home for children being treated at the National Institutes of Health and their families. More than $3,000 was donated. When it was Kotzin’s turn to speak to the overflow crowd of colleagues, past and present, he thanked the people he learned from over the years—people throughout the NLM family, the library community, and the publishing field. 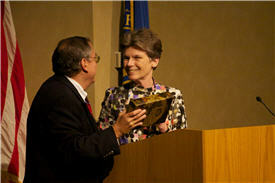 Bottom Photo: NLM Deputy Director Betsy Humphreys presents Kotzin with a box containing a card from an old NLM card catalog. Photo by Troy Pfister.